Service Description: The Winnergy Service is a revolutionary service offered by Noble Exchange under its initiative to turn kitchen waste into cooking gas that is carbon neutral, through a 100% natural process. They use cutting edge Anaerobic Digestion (AD) technology to generate bio gas rich in methane and CO2, which will be compressed and commercialized to replace fossil fuel. As a part of this service, Noble Exchange installs a clean energy plant on the premises of the client and processes kitchen waste generated on the site into 100% eco friendly gas. This eco friendly gas can be used either for cooking purposes or for producing electricity as per the client’s requirement. The plant also produces odorless and nitrogen rich organic manure as a by-product of the process. This service is ideal for star hotels, restaurants, corporate parks, IT Campuses and residential societies / townships too. Did you know? : This technology is being utilized in Noble Exchange’s talegaon plants, which is the world’s largest capacity food-waste-processing plant converting over 1700 tonnes of waste, generated in the city of Pune, to value! 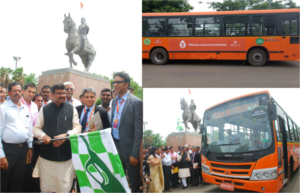 The technology is also being used in biofuelled buses across Pune.